In a world where you never know what might happen next… In a society where when the seams crack strangeness inevitably oozes out like napalm puss, former UFC fighter and host of MTV’s “Bully Beatdown”, Jason “Mayhem” Miller, 31, was arrested in Mission Viejo, Calif., early this morning after he was found naked inside a ransacked Mission Hills Church. Officers responded to a burglary call at 8:33 a.m. PT on the 24100 block of Alicia Pkwy. When they arrived on the scene, according to celebrity gossip site TMZ.com, who first reported the news, police found the first and second floors of the church covered in white fire extinguisher spray and the inside of the church had been trashed with scattered CDs, books and broken pictures. When officers reached the second floor they found Miller naked on a couch, awake and coherent. Miller was taken into custody for burglary and was medically evaluated. At this time it is unclear if the MMA veteran was under the influence of drugs or alcohol. Miller is currently being held on $20,000 bond at the Santa Ana Intake Release Center (IRC) in Orange County where he will appear before a judge on Wednesday. His occupation is listed as “Comedian”. Miller (28-9, 1 NC) made his UFC debut against Georges St-Pierre at UFC 55 in 2005, losing a unanimous decision. After six years fighting on smaller shows, he made his return to the UFC last year as a coach on The Ultimate Fighter season 14 opposite Michael Bisping. Miller and Bisping faced off in the TUF 14 Finale where he ultimately lost to the Brit via third round TKO. He made one more return to the Octagon against C.B. Dollaway at UFC 146 in May, losing a unanimous decision. Miller made headlines over the weekend after he and UFC President Dana White exchanged heated words over Twitter and he told White “Kill yourself @danawhite we are all begging you”. 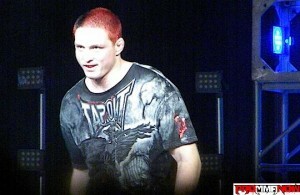 He also challenged White to a fight, and White reminded him he had never won a fight inside the UFC.